Don’t want vendor lock-in? Better think hard about “platforms” and your procurement information architecture. As services spend under management increases, it leads to more services procurement, and procurement organizations will be looking at services spend beyond the traditional category taxonomy view of world in order to squeeze more value out of it. Don’t fall for the myth of integrated ERP procurement. 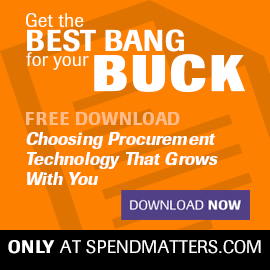 Do We Need to Debate Procurement Centralization? The centralization vs. decentralization argument in procurement is more of a myth than anything else – at least for companies that are further along the bell curve. SAP is shaking up its cloud business. Or perhaps the cloud is shaking up SAP. Right No. 1: Buy an enterprise-class application that can link to multiple suppliers and supplier networks. Can You Get Away With Having Your Team Use Inexpensive Sourcing Tools? Lower-end tools tend to cover the sourcing basics at highly attractive price points (or not, in the case of the ERPs). What are the positive of using these lower-end sourcing tools?